We offer a range of services in this area. Ongoing site maintenance – updating and maintaining your web site. We like to work with you to understand your business and requirements so that we can find the right web solutions for your business that meets your needs and budget. No unnecessary extras, just what you need but designed so that your website can grow with your company as your business grows. We are not just web designers, we can provide a range of flexible solutions. If you want to keep costs down, you can provide the content and we will do the website design based on this. We can offer template or bespoke personal or business web designs. If you prefer, we can bring in a graphic designer, photographer, videographer, web copywriter, marketing expert, web developer or whatever else you need to get the job done. We can help with logo design, branding, marketing as well if you need it, a complete one-stop-shop service saving you the trouble of searching for all the individual services you need. We can provide a range of ecommerce solutions to suit your needs. You can start with a low cost starter online shop and then as your business develops, our web developers can craft a more powerful, bespoke solution for you. We always try to ensure that whatever solution we provide can be upgraded so that it can grow with your business. 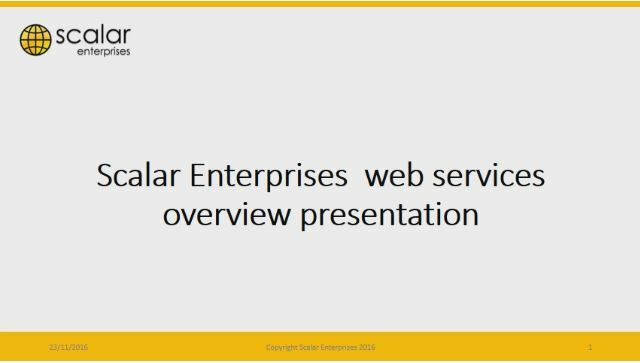 Scalar Enterprises is not like some other web design companies. Having nearly 40 years experience working in many different businesses, from large multinationals to smaller companies, at all levels we understand business. We have a broad range of technical knowledge and skills, many years experience of market analysis, requirement definition, design, development, problem solving and customer support and lots more. Our first web design was done in the mid ninety’s so we have learnt a lot over the years and we are continuing to learn and constantly update our skills. This allows us to develop customised solutions to suit exactly what you need. Don’t delay, give Steve a call today on 02392 660794 to discuss your requirements and get your web site up and running and growing your business.